Description: This assortment is the very first assortment of Puffalumps made by Fisher-Price. It contained one each of six different individually boxed Puffalump animals. Although this assortment was made for only 1 year, the individual Puffalumps introduced in this assortment, except the lamb, were used in other assortments in 1987 and 1988. Each Puffalump is made of soft pastel colored fabric. They are extra cuddly and feather light. Each was sold with a one-piece removable outfit. #8001 Cow - White cow wearing a white dress with 3 pink hearts on the collar. #8002 Kitten - Yellow kitty wearing a yellow dress. #8004 Bunny - Pink bunny wearing a pink dress with a sailor's collar. #8005 Lamb - Pink lamb with a white face, wearing a pink dress. #8006 Bear Cub - Peach bear cub wearing peach shirt and shorts (attached). Click on the links above to see the color variations for each Puffalump. 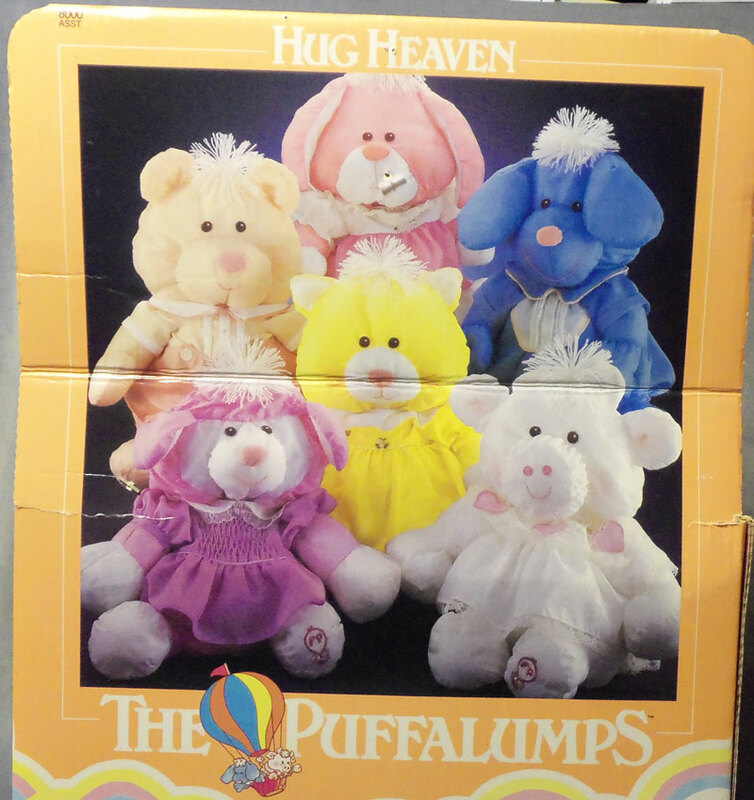 Each Puffalump in this assortment was sold in a 11" long, 14" high, 8-5/16" deep hands-on display box. These boxes have pastel colored clouds on them and Puffalumps in a hot air balloon on the front. This assortment was replaced in 1987 with #8019 Domestic Animal Collection and #8020 North American Collection. Also see 1988's #8030 Puffalump Collection.